With the ever-growing role of the television in the modern home, more and more time seems to be spent in front of a TV. From movie night to family meals, the living room furniture set seems to take priority over the dining sets. According to an article by The Atlantic, even with the widespread use of smartphones and tablets, the television is still the main attraction when it comes to staring at a screen. As such, with this increased amount of time spent watching programming, households tend to gravitate from the dining room to the living room. However, most people still have a dining set in their home even though it has little to no usage. Reading the article mentioned above made me evaluate how I used the dining sets of my past and present. When I was a child, while we had a television, we were not allowed to eat in front of it. It’s almost as if my mom (it was her rule) knew that distracted eating was a bad thing. Interestingly, a study done in 2013 by Harvard Medical School indicated that watching TV while you eat can lead to weight gain. Being distracted by a screen can hinder your ability to notice you are full. So, as children, we were made to sit at the dining room table when we ate anything from dinner to a midday snack. Once the majority of my siblings and I were college age, this rule had gone out the window and the dining room set had transformed into a place where we sat and talked. My parents still sat there for any meals where they were together, but we, as an entire family, only ate there on special occasions. I chalked that up to the fact that between school and jobs, we were hardly together at the same time. As a person with my own family, I admit we eat the majority of our meals in the living room. The dining room has mainly become a place to do homework or to work on arts and crafts. We spend the holidays at my folk’s house so even on those days, it’s empty. Occasionally, I’ll prepare a special meal and listen to my kids complain that we’ll be eating in the dining room. It’s humorous to watch as they slowly make their way to the table and act like they have been punished. However, I have noticed that they quickly get over it and join in the conversation. They do like for me to ask about their day. I think they enjoy having the floor to speak about their triumphs and tribulations. So, when we’re in the living room eating from TV trays, I’ll pause the TV and ask about their days. They will hurriedly answer me so that we can get back to the program. Because of all I’ve noticed, I’ve made it my goal to use the dining room for meals much more often. After all, since you can record your shows so easily now, why not give it a try. Whether you use your set often or for special occasions, it’s always nice to have one that fits your style. At Santa Fe Terra, we have a special selection of rustic dining sets, bars, and tables that are beautifully inviting. 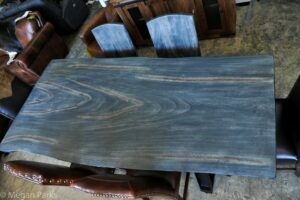 Our staff is here to help you choose the perfect item for your dining room. From family meals to entertaining guests, your dining room will be a fantastic place to gather. ← How Does Your Bedroom Treat You?